At 41 North Phillips Avenue. Residents of Speonk and Remsenburg packed into Southampton Town Hall last Thursday, July 28, to hear the latest of numerous development proposals for their hamlet. Georgica Green Ventures, the workforce housing developer behind Southampton’s controversial Sandy Hollow Cove workforce housing complex in Tuckahoe and several projects underway in downtown Riverhead, has an option to buy a 4.28 acre property along a sleepy stretch of North Phillips Avenue just south of the Speonk Long Island Rail Road station. The front acre-and-a-half of the property along the street is zoned for village business, and the back portion is zoned for half-acre residential lots. Georgica Green is asking the town to consider slightly modifying the line between the village business and residential zoning districts, and rezoning the back portion of the property to MF-44, a multi-family housing zoning designation that would allow 12 units per acre. In total, they are proposing 51 units, which would be managed by a nonprofit agency and would be made available to individuals and families earning between $37,000 and $86,000 per year. The town board has not yet decided whether to consider the application, and is awaiting a recommendation from the town’s planning department at a work session in early September before deciding whether or not to schedule a public hearing. The July 28 work session was a preliminary opportunity for Georgica Green to explain their proposal to the town board. Mr. Gallo said the site, which is readily accessible by public transportation and within walking distance of the small number of shops in Speonk, has been singled out in planning studies as one that would make sense for workforce housing. 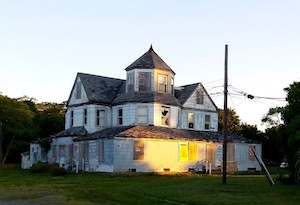 On the property now is a towering, dilapidated former hospital and boarding house, which according to the town’s historical property survey of Speonk and Remsenburg, was once the cottage of W.H. Fordham, and later was known as the Hoag Hospital, where many Speonk residents were born in the 1920s. According to the town report, Mrs. Hoag married a Mr. Kropp around 1930, and the couple turned the property into a boarding house. Mr. Kropp rented rooms to the Long Island Rail Road crew at the time, so they would be near the station when the first train pulled out in the morning. Mr. Gallo said there would be 10 studio apartments on the site ranging from 450 to 550 square feet, 25 one-bedroom apartments ranging from 600 to 725 square feet and 16 two bedroom apartments ranging from 750 to 900 square feet. Rents would range from $930 to $1,750 per month. Architect Michael Russo said that, under the current zoning, the back portion of the property could accomodate five six-bedroom homes and the street frontage area could accommodate 15 offices on the ground floor, with 10 apartments above. Town board members said they’d received more than 150 emails, mostly opposed to the project. The board broke with its usual practice of not accepting public comment at work sessions to give the roughly 40 members of the community who attended a chance to speak. Craig Catalanotto, a founding member of the group Remsenburg, Eastport, Speonk Communities United, or RESCU, said his group isn’t opposed to affordable housing, but they’ve been overwhelmed by the large number of development projects underway in their community. He added that, when the train is in the Speonk station, traffic on North Phillips Avenue often backs up for 10 minutes while the railroad crossing gate is closed. He urged the board to consider keeping the current zoning intact, with homes for seniors and accessory apartments for workers. “Speonk-Remsenburg says yes, and we hope that you will listen,” he said. Kerry Horton asked Mr. Schneiderman how he felt about the town’s Housing Authority, which would partner with Georgica Green on the property management if the project were built. “You need to look into this, before you consider this application at all,” she said. Mr. Schneiderman said the town is aware of the unused housing vouchers. But Southampton Housing Authority Director Curtis Highsmith, who was in attendance, said he would be willing to explain the issues with the vouchers if anyone had asked him. He said that the federal Housing and Urban Development (HUD) administrators give the town a certain number of vouchers, but they also give the town a set amount of money to use in conjunction with those vouchers based on average rents in the area. But the area covered by HUD’s average rent calculations includes Riverhead and other lower rent areas, as well as Southampton Town, and, he said, people often take Southampton’s vouchers to other areas where the rents are cheaper, or don’t bother to use the vouchers at all.